New fears have been raised about tumble dryers catching fire, despite efforts to modify the machines. The BBC's Watchdog Live consumer programme has uncovered cases in which the machines have caught fire after being fixed. Some 5.3 million tumble dryers under the Hotpoint, Creda and Indesit brands required modification. Whirlpool, which owns the three brands, said it had total confidence in the fix for the machines. The original defect was discovered in 2015 and has reportedly led to scores of fires since 2004. The company began a huge operation to modify or replace dryers to ensure they are safe. However, Watchdog spoke to Vicki Mudge and her sister-in-law Jemma Greenslade who said they had to drag Vicki's burning tumble dryer out of their flat. It had earlier been modified. Image caption Jemma (left) and Vicki had to drag a burning tumble dryer out of their flat. "You do trust them to think they are fixing something so it is going to be ok. It is disgusting really," Jemma said. They said that, as they lived in a block of flats, the fire could have been a risk to their neighbours. Domestic service engineer Graham Watkinson - who has worked with electrical appliances for over 40 years - believes the modification does not totally remove the risk. Charlie Pugsley, deputy assistant commissioner at the London Fire Brigade, said he was seriously concerned about the reports of modified dryers catching fire. "There is going to be a time delay between the modification and the fires occurring so if we are starting to see one or two, I would imagine it is only going to get worse," he said. "Each fire has got the potential to do huge damage to someone's home and risk lives." 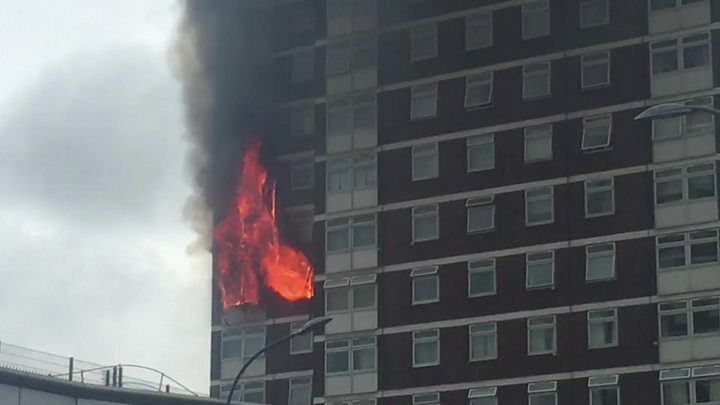 In August 2016, a dryer - awaiting modification - was blamed for a huge fire in a West London tower block, with more than 50 people forced to flee their homes. Despite that incident the company continued to state the machines were safe to use as long as someone was in the property. Which? threatened to bring judicial review proceedings against Trading Standards over the advice being given. Trading Standards instructed Whirlpool to issue new guidance earlier last year that the dryers should be unplugged and not be used until they had been repaired. Andy Slaughter, the MP in the area of the tower block fire, said: "I am really worried that people now think that the problem is solved - that they can go out, go to sleep and leave machines on - because they have been modified or replaced, but actually there is still a real danger that they could catch fire." In a statement Whirlpool said: "We have total confidence in the modification. Extensive testing and analysis of the modification both before and since its implementation has shown it provides an effective solution for the issue. "An external review with the input from three independent experts in fire safety, product safety, and engineering, concluded that the modification remains the most effective way of rectifying this issue for consumers. "There have been no reported incidents where the modification has shown to be ineffective. Recent criticisms of the effectiveness of the modification are based on fundamental technical misunderstandings of what it addresses. We are concerned that such misinformed criticism risks discouraging consumers from registering for this important safety modification. "We continue to urge consumers to contact us immediately if they believe they still own an affected appliance. We can assure consumers that if they contact us now, they can receive a resolution within one week."